The Global Crisis that started in 2008 resulted in a sharp recession and soaring unemployment rates in the euro area. However, the size of the decline in output and jobs varied. The impact in southern Europe, Ireland, and the Baltic republics was dramatic, while most central and northern European countries were only mildly affected. This is because the recession was much worse in some countries than others. Ireland, Spain, and later Greece suffered a sudden stop in capital flows. Greece, Ireland, Portugal, Cyprus, and, to a lesser extent, Italy experienced a confidence crisis in public debt and runs on their banks. Greece, Portugal, Spain, and others implemented harsh fiscal consolidations. Many southern European countries, under the pressure of financial markets and international institutions, implemented radical changes in their labour, product, and banking sector regulations (Manasse and Katsikas 2018). We find that reforms that liberalised labour and product markets tended to reduce both hysteresis and resilience. 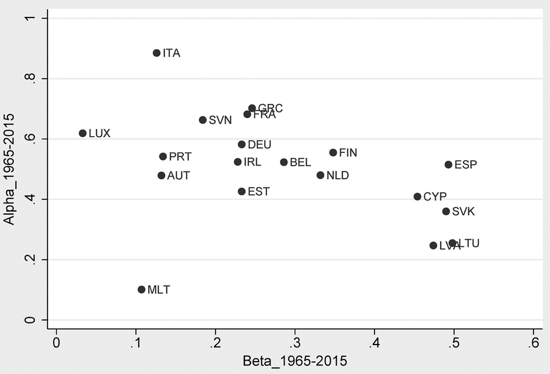 We estimate a dynamic Okun-type relationship separately for 19 countries in the euro area, using OECD annual data from 1965 to 2014. We assume that the deviation of the rate of unemployment from its equilibrium value (the non-accelerating wage unemployment rate) depends on the output gap – the deviation of GDP from potential. Unlike previous studies (e.g. Gordon 2011), we make the standard Okun relationship dynamic by introducing the value of past unemployment deviations. This means we can estimate the speed of adjustment of the rate of unemployment toward long-run equilibrium. The regression coefficient of the output gap measures the short-run elasticity of the unemployment gap to the output gap. The smaller the absolute value of this parameter (beta) is, the more resilient the country’s unemployment rate. Similarly, the coefficient of the lagged unemployment gap (alpha) measures the persistence of the unemployment response. The closer the parameter to unity, the more persistent the effects of a shock. Figure 1 illustrates the relationship between ‘resilience’ and ‘hysteresis’. Each country is represented by a dot; the coordinates are, on the vertical axis, the estimated beta coefficient and, on the horizontal axis, the alpha coefficient (both in absolute values). Note: Beta represents the point estimate of the output gap on the unemployment gap of the corresponding country. Alpha represents the point estimate of the lagged unemployment gap on unemployment gap in the corresponding country. Italy, Portugal, and Greece appear in the upper-right region of high resilience and high hysteresis. Cyprus, Spain, Latvia, Slovakia, and Lithuania are in the lower-left region of low resilience and low persistence. Malta and Italy are at the extremes of the hysteresis range. The rate of unemployment takes as little as three months or as long as five years and eight months, respectively, to recover half-way to their equilibrium values. Luxembourg and Spain are at the extremes of the resilience dimension. For Luxembourg, a 1% fall in the output gap is reflected into only a 0.03% change in the unemployment gap. In Spain, by contrast, this elasticity is 0.47. We may conjecture that high resilience and high hysteresis, as in Italy, exemplifies a ‘rigid’ labour market, in which high firing and hiring costs (Bentolila and Bertola 1990) and strict employment protection legislation prevent firms from cutting employment in downturns, at least in the short run, also raising the unemployment persistence in the long run. We may also imagine that low resilience and low persistence, as in Spain, represents 'flexible' markets. To test this, we estimate a model that allows our resilience and persistence parameters to change over time according to changes (structural reforms) in the institutional features of the labour and product market. We use the popular OECD employment protection legislation index, the index of centralisation in wage bargaining, and the product market regulation index. These range from zero (the least regulated) to six (the most regulated) (OECD 2015, Visser 2015, Conway and Nicoletti 2006). The estimation results suggest that a more regulated product market and a more centralised wage bargaining system are associated with a lower impact of output on unemployment. Also, a more regulated product market and more centralised bargaining system are associated with more persistent unemployment. Finally, we find that a more restrictive employment protection legislation is associated with higher hysteresis, but not significant ‘protection’ effects against output shocks. There is an important question that we can answer using this framework: Did the structural reforms hastily introduced by southern European countries during the crisis worsen their unemployment outlook? The short answer is “yes, but…”. The effects were relatively small, and quickly reversed. We construct a counterfactual scenario in which there had been no reforms, by freezing the structural indicators at 2007 values as a comparison. A positive difference between the actual and counterfactual unemployment gap would imply that reforms raised unemployment. We will limit our discussion to the results for Greece, because the reforms there where most noticeable and had the largest effects on unemployment. The left-hand panel of Figure 2 shows the indexes of product market regulation and wage centralisation, which we find to be the most significant features that affected the labour market response. The most radical reforms in Greece concerned labour, rather than product markets (Manasse 2015). The right-hand panel shows the difference between the predicted (‘with reforms’) and the counterfactual (‘no-reforms’) unemployment gaps for Greece. The reforms implemented since 2010 are initially associated with a rise in the difference between the actual-counterfactual unemployment gaps, which reaches 1.1 percentage points in 2011. This effect originates from the fact the reforms have reduced the resilience of the labour market to shocks, exactly at a time when the economy was experiencing a dramatic recession. However, the differential turns negative as soon as 2013, suggesting the positive effect of the reforms soon kicked in, reducing unemployment persistence. Other countries showed significant effects from the reforms implemented between 2008 and 2014, but they were small and temporary. Source: Aksoy and Manasse (2018). Note: The left-hand panel shows the OECD Product Market Reform Index (PMR) and the Centralized Wage Bargaining Index in Greece. The indexes range from 0 (least regulated) to 6 (most regulated). The right-hand panel shows the difference in the predicted unemployment gap and the predicted gap when the CWB and PMR indicators are kept constant at their 2007 value. Our findings are consistent with the view that labour and product market reforms speed up the recovery from recession and so yield long-run benefits. But we also find that reforms have tended to make the labour markets less resilient to shocks. This second effect, though small, prevails initially. Therefore caution should be used in implementing labour market reforms during large recessions and fiscal adjustments, since the reforms, particularly those of the labour market, may make job losses worse, and compromise support for reforms. Aksoy, T and P Manasse (2018), "The Persistence-Resilience Trade-off in Unemployment: The Role of Labour and Product Market Institutions", in P Manasse and D Katsikas (eds.) Economic Crisis and Structural Reforms in Southern Europe: Policy Lessons, Routledge. Bentolila, S and G Bertola (1990), "Firing costs and labour demand: how bad is eurosclerosis?" The Review of Economic Studies 57(3): 381-402. Cazes, S, C Heuer and S Verick (2011), Labour market policies in times of crisis, Palgrave Macmillan. Conway, P and G Nicoletti (2006), "Product Market Regulation in the Non-manufacturing Sectors of OECD Countries", OECD Economics Department working paper 419. Gordon, R J (2011), "The Evolution of Okun’s Law and of Cyclical Productivity Fluctuations in the United States and in the EU-15", Presentation at EES/IAB Workshop, Labour Market Institutions and the Macroeconomy, Nuremberg, June. Manasse, P (2015), "What Went Wrong in Greece and How to Fix It", VoxEU.org, 12 June. OECD (2015), Employment Outlook, OECD. Visser, J (2015), ICTWSS Database Version 5.0, Amsterdam Institute for Advanced Labour Studies AIAS.